A new Special Edition (SE) trim debuts, adding 17-inch alloy wheels, rear privacy glass and a security system to the base LX. Otherwise, the 2016 CR-V is unchanged. While not the most thrilling vehicles on the planet, small crossovers offer a lot of functionality at an attractive price. They give a commanding view of the road thanks to their elevated ride height and easily accommodate four occupants and their luggage. Their engines are typically small and modestly powered, but fuel-efficient. As long as you’re not looking for a spirited driving experience, few vehicles are as well-rounded and practical. 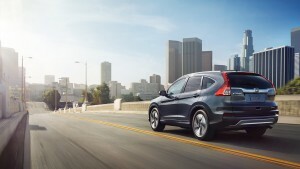 Among this group, the 2016 Honda CR-V is one of the best. Everyday usability is the driving force behind the CR-V’s interior design. The wide doors allow for easy ingress and egress, and head- and legroom are ample for front and outboard rear passengers. A passenger sitting in the rear middle seat will also appreciate the lack of a protruding transmission tunnel that would otherwise necessitate an uncomfortable seating position. Farther back, the CR-V’s cargo area is vast, with 37.2 cubic feet of space ready to swallow just about anything you want throw back there. Pull the trunk-mounted levers and the spring-loaded rear seats fold down immediately, nearly doubling the CR-V’s cargo capacity. 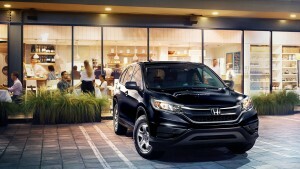 Honda also offers a long list of available safety and comfort features for shoppers wanting a little extra. A sunroof, keyless ignition and entry and heated front seats are standard equipment about halfway up the CR-V’s hierarchy of trim levels. Also included on that trim (EX) is a trick passenger-side-mounted camera that reduces the blind spot by displaying a wide-angle picture on the central touchscreen when the right blinker is turned on. Those looking for additional safety features may want to consider the top-tier CR-V Touring, which adds lane-keeping assist and automatic braking when the CR-V senses an impending forward collision. The LX comes standard with 16-inch steel wheels, full power accessories, a rearview camera, cruise control, air-conditioning, a height-adjustable driver seat, a tilt-and-telescoping steering wheel, a conversation mirror, a 60/40-split-folding and reclining rear seat, Bluetooth phone and audio connectivity, and a four-speaker sound system with a CD player, a USB port, an auxiliary audio jack and Pandora Internet radio compatibility. The EX adds automatic headlights with LED daytime running lights, a sunroof, foglights, a retractable cargo cover, keyless entry and ignition, an eight-way power driver seat (with two-way power lumbar), heated front seats, a blind spot monitoring system with a camera that shows your passenger-side blind spot (Honda’s LaneWatch), a 7-inch touchscreen with HondaLink smartphone app integration, dynamic guidelines for the rearview camera and a six-speaker sound system with an extra USB port. The EPA’s estimated fuel economy on 2016 CR-Vs with front-wheel drive is 29 mpg combined (26 city/33 highway), a superb showing for this segment. 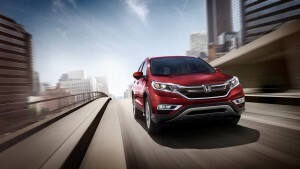 The all-wheel-drive CR-V, at 27 mpg combined (25 city/31 highway), is right behind. The 2016 Honda CR-V comes standard with antilock brakes, stability and traction control, front seat side airbags, side curtain airbags and a rearview camera. The LaneWatch blind spot monitoring system (featuring a camera of its own that displays passenger-side blind spot activity on the 7-inch touchscreen) is standard on all but the LX and SE. The Touring boasts a lane departure warning system and a forward collision warning and mitigation system that’s able to distinguish between vehicles and pedestrians (and warn the driver accordingly) as well as apply automatic braking intervention to reduce the severity of a collision. The 2016 CR-V provides one of the most practical cabins in the segment. There’s an abundance of space for rear passengers, and those seats recline and have child safety seat LATCH anchor points in all three seating positions. Space up front is good, too, especially with the added adjustability that comes with the available power driver seat, providing superior visibility and a sense of openness. 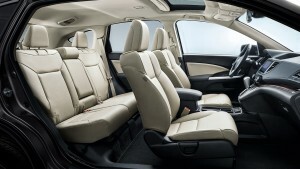 Less impressive are the materials that fill the interior of the CR-V. The cabin is a sea of hard plastics as far as the arm can reach. It wouldn’t be so bad if not for the numerous rivals with interiors that look and feel more upscale. 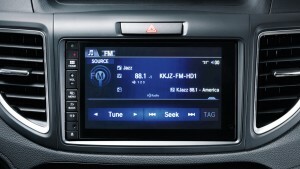 Although most controls are logically laid out and easy to learn, the 7-inch touchscreen suffers from some difficult-to-decipher buttons and an occasionally confusing menu structure. We also dislike the lack of volume and tuning knobs. Aside from that touchscreen, notable tech features include a rearview camera, Bluetooth (phone and audio), a text-message reader with a digitized voice and Pandora compatibility. Those are all standard on the base LX, by the way; they’ll run you extra on many competitors, if they’re offered at all. On the other hand, certain popular features are restricted to the highest trims, including a power liftgate. While 185 hp seems like a healthy amount from a four-cylinder engine, most of that power doesn’t arrive until high up in the rev range. You’ll need to wring it out for highway passing. 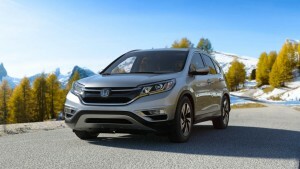 Overall, the Honda CR-V’s engine power is adequate, but many other competitors, including the Santa Fe Sport and Escape, offer more powerful optional engine upgrades that provide quicker and less stressed acceleration. On the upside, the CR-V boasts impressive fuel economy, and one reason is the now-mandatory CVT. Some CVTs can seem odd in the way they change and adjust the engine’s rpm compared to traditional automatics, but to Honda’s credit, the CR-V’s CVT doesn’t draw attention to itself in normal driving. Indeed, it’s so unobtrusive that you tend to forget it’s there, which is why we consider it one of the better CVTs in any vehicle. We will note, however, that in Edmunds.com consumer reviews, many consumers have complained about distracting vibrations in their 2015 CR-Vs, and that was the first year for the CVT. 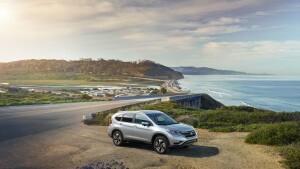 It’s something you’ll want to pay attention to if you’re test-driving a current CR-V. In terms of handling, the 2016 Honda CR-V feels secure when going around turns, but numb steering feedback and plenty of body roll when cornering prevent it from stimulating much driver excitement. 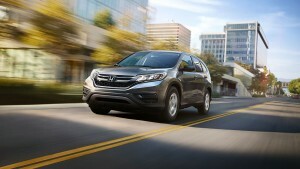 The CR-V does have a very smooth ride, though, and the suspension soaks up many of the bumps along the way. It’s also one of the quietest small crossovers available with regard to road and wind noise.